This really pushes all my buttons. Give me this and leave me to die. In Western Turkey it is known as acuka (pron: a-joo-ka) but the further south you go, especially to the southeast, it becomes muhammara. I love the sound of that. It originates from Aleppo in Syria. Forget sweet jams or weetabix or cheerios for this is a typical Turkish breakfast spread that you put on bread. It is delicious beyond belief. But interestingly enough, TT doesn’t know it and today I was with my English friends all of whom have been here a long time, and they didn’t know about it either. I really can’t explain why we don’t know. I have been on the track of acuka for a few weeks now, ever since discovering a little pot of it at a local supermarket, albeit an upmarket one, Nezih Gürme Market, here in Selami Çeşme in Istanbul. It was called Ev Acukası/home acuka. I bought it unhesitatingly and it was devoured within days. It is fabulous but the thought crossed my mind that I could probably make it myself as I read what the ingredients were. So I sat down at the computer and discovered that yes, there are lots of recipes out there. I carefully deliberated, compared, and finally chose to try this one from the blog New York’s Delight as it sounded very authentic. I wasn’t disappointed. Try it and I think you will agree. I am thrilled with the result! It is one of the best tastes that I have enjoyed for a very long time! 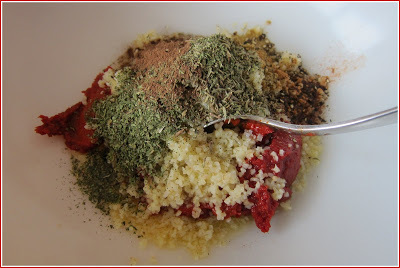 · Put pepper and tomato pastes, bread crumbs or bulgur, crushed garlic, lemon juice, olive oil, and salt into a mixing bowl. 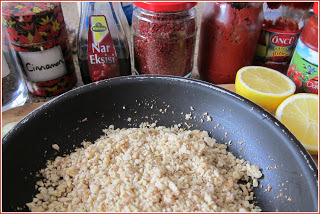 · Heat frying pan and gently toast chopped walnuts for a few minutes. This releases their natural oils and gives the dish additional flavour. Add to mixture. 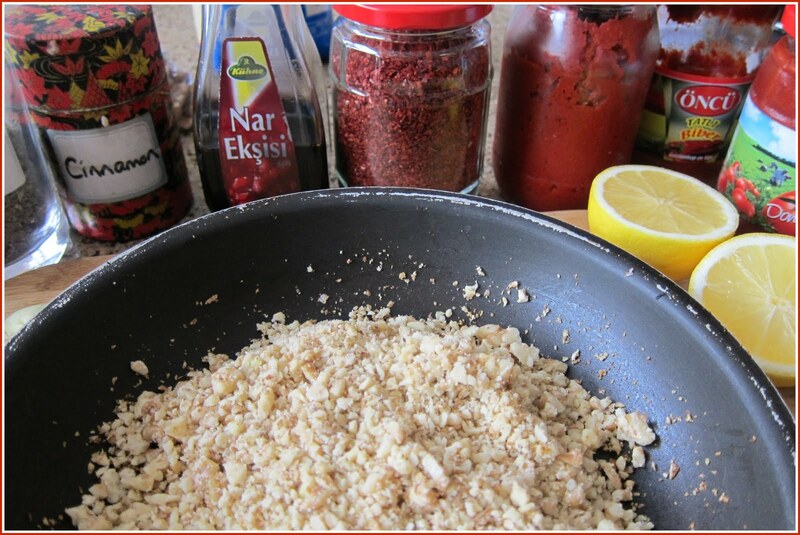 · In the same frying pan, heat and toast the spices for a few minutes. Add to to the mixture. Mix well. · If you need a little more salt, add a bit more. If you want the dish to be a bit more garlicky, add another clove of garlic. The garlic is what really adds to the taste of this dish. · Mix everything well together and serve either with bread as a spread or with crackers as a dip. I must say, in Turkey it would be with bread as the idea of dips is not common. Consistency is up to you. TT and I prefer chunky but you may like it smoother. In that case, blitz those walnuts till they are finer. 1. I don’t know how easy it is to find pepper paste outside Turkey. 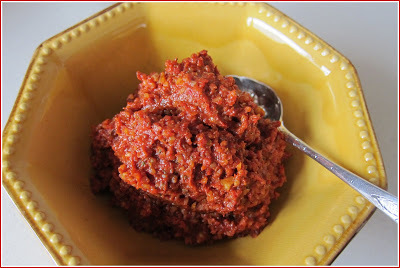 If you can’t, I would suggest making up the amount with the very best tomato paste that you can find. 2. All the spices are also arbitrary. I made my acuka today using exactly the measurements specified above and we found the result absolutely scrumptious! I know I can't pronounce it but I would definitely like to try this yummy spread!Have a lovely evening,Claudia! Oh this is definitely one that I'm going to try! Oh, yum! And you've saved me some researching work. My neighbor brought us a plate of something very much like this (she's from Gaziantep and a fantastic cook), served with mercimek köfte. When I tasted it, I thought, "Oh, this shouldn't be too hard to make, and yum!" I was going to trade her my chocolate chip cookie recipe (which I made in return for the köfte), but I was daunted not just by translating the language, but converting the measurements… So thanks! Your recipes are so interestingly delicious to me! Always a new adventure here.. Thanks for sharing! Another tempting recipe from you, at this rate I won't fit into an airline seat later in the year when we come 😉 We'd love to go to Assos, will there be time? We must start planning soon. Glad you like the sound of this! Thank you for all yr comments. After I posted this, I thought oh it may be just too spicy for general taste, too garlicky. 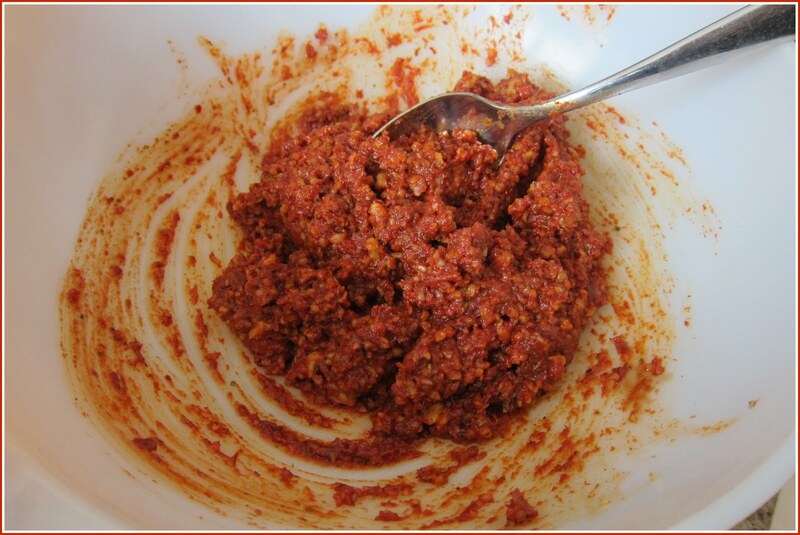 But definitely worth trying and after all, you can make it less spicy if you want. Julia, I thought you were going to say 'it's dangerously fattening!!! Stranger, when are we going to have that coffee? And Knitsister, let's plan!! Ayak, how're things going babywise? Lenia and Glorious: nice to hear from you both! I have two questions for you: How long did you soak the bulgur for? I put 1/4 cup bulgur in a bowl, then poured about 1/4 boiling water over it. In about 5 minutes, the water has been completely absorbed, so I assumed it was done. 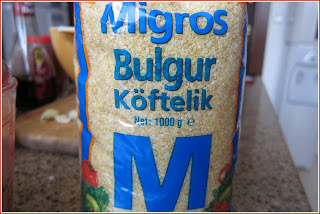 However, the bulgur was not at all soft and was instead quite crunchy. Also, do you think this can be frozen? I now have so much open pepper paste that I want to make more but I can't eat it all at once! Hi Barbara! I am so happy to hear from you again. Also happy you liked this acuka – we have already finished that first lot and I am making more tomorrow! I too just soaked the bulgur while I was doing something else. 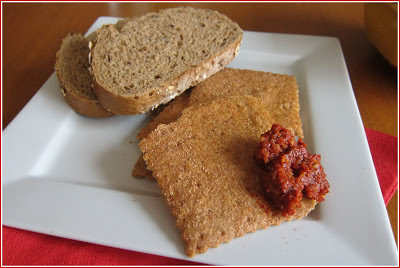 All the water was absorbed but I tried a few grains: they were a bit crunchy but I decided that was fine – which it was. Did you use the fine grain bulgur? Hmm – freezing – can't say. I would say rather go the sterilized jar way which is what I am going to do – washing the jars in warm soapy water, and then putting in a very hot oven or boiling. I gave some away from that first batch and they loved it too!! And thank you, Froggie and thank you, Mary. It is so nice to get comments. I am interested: which ingredients, Mary, do you think might be difficult to find where you are? 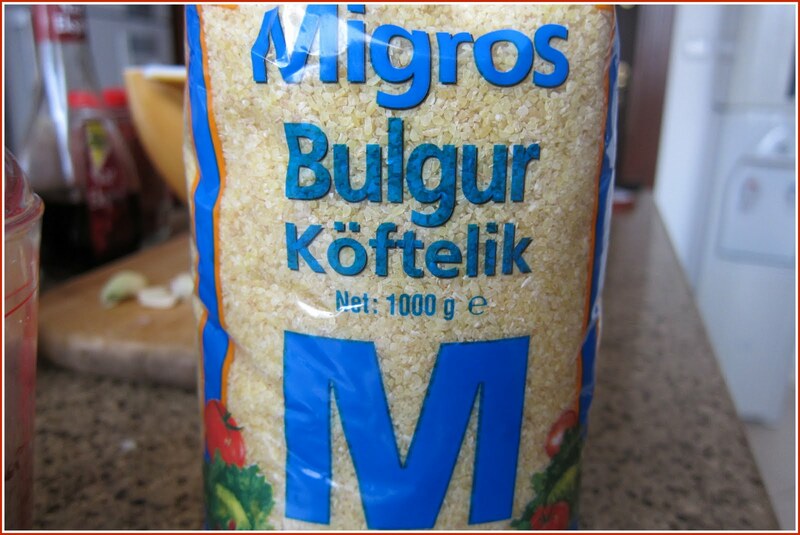 Ah, I bet the bulgur was not fine grain….and in fact, upon checking, it's not! I will rectify that for next time for sure! It added just a bit too much crunch for my liking. As for freezing, I may just try a little bit and see how it turns out, but most likely I'll just pass along some to the neighbors! We love to exchange food! I wondered what this was. In Antalya, one of the restaurants served it with the breads they brought out. Yum! Can't wait to try it! Hi Claudia – Thank you much for trying out the recipe! Glad to read that you and your readers liked it! You have a great blog here! Really enjoyed reading your Turkey adventures!